The Episcopal church in Hamilton has a unique history in that it was organized initially in 1823 but lapsed several times before it found a lasting foundation in Hamilton. In 1823, a small group of church members were organized by Bishop Philander Chase, then president of the University of Cincinnati. They formed a parish, St. Matthew, which was under the care of the Rev. Samuel Johnston, rector of Christ Church in Cincinnati. By 1834, the charter for the parish had lapsed and the first St. Matthew's parish was defunct. In 1835, the Episcopalians of Hamilton again united under Rev. Ethan Allen of Dayton, Ohio. They again named their parish St. Matthew and set about building a church to hold services in. On September 22, 1835, a cornerstone was laid for the new church at the corner of Front and Basin (Court) Streets. In 1837, the church was completed. Financial problems plagued the congregation and with a dwindling membership became unable to make the payments on the church mortgage. On May 23, 1848, the church was sold at a public auction to a group of Irish Roman Catholics who would go on to found St. Mary's Church in Hamilton. A third attempt to found an Episcopalian Church in the city was begun in 1868 when Christ Church was organized. In 1870, a former church building on Third Street in the Third ward of Hamilton was purchased with the intent to repair it for the use of the congregation. With minor repairs, the church was ready for services. However, lack of funds again forced the church building to be sold. 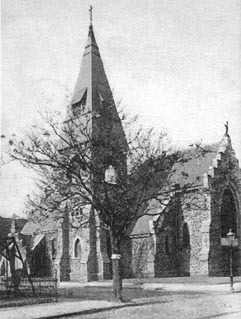 The church was sold at auction on December 17, 1881. Finally, in 1883 a mission church, Trinity Mission, was founded and placed under the care of Rev. Henry Gregory, Rector of Ascension Church, Middletown. In 1884, land was purchased at the corner of Sixth and Butler Streets. Ground was broken for a new church in November, 1887 with the church being completed during the summer of 1888. An addition was added to the building in 1893 and on May 31, 1894, Trinity Episcopal Church was incorporated. 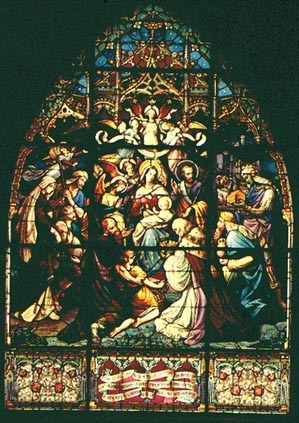 The stained glass window, "Adoration of the Magi," was crafted in Innsbruck, Austria in 1894 as a memorial to Colonel Alexander Gordon, a parishioner and benefactor of Trinity Episcopal. It was situated over the altar of the church. Those with questions, comments, or additional information are encouraged to contact the Society.